Welcome to the newly renovated Kiewa Valley Snowsports in the heart of Mt Beauty Victoria at the base of Falls Creek Ski Resort. 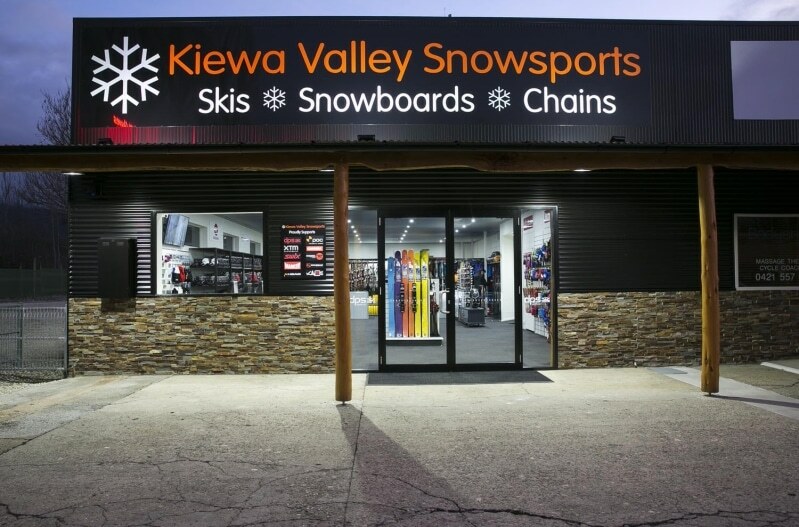 Kiewa Valley Snowsports is your One Stop, friendly and family owned Shop providing modern high quality and carefully maintained ski and snow board equipment right at the base of the mountain with very competitive prices, please compare us. We also provide and sell Falls Creek Resort Entry Passes and snow chain rental, please enquire about our Half Price Snow Chain Offer. Kiewa Valley Snowsports stocks a wide range of gloves, beanies, goggles, socks, thermals, outerwear, helmets and many other accessories for all your riding needs. We also have a new modern workshop and provide waxing, tuning and repairs for all skis and snow boards. At Kiewa Valley Snowsports we strive to ensure that your equipment is correctly suited to you and your ability to ensure a safe, fun and progressive riding experience. We look forward to meeting you soon.